Hilton Head Island is a semi-tropical barrier island located on the Intracostal Waterway off of the South Carolina Atlantic Coast, about 90 miles south of Charleston and 40 north of Savannah. It is world-renowned for its pristine beaches, abundant golf courses, superb tennis facilities and picturesque natural environment of seascapes, salt marshes, lagoons, tall pine forests, magnolias ​and majestic moss-draped oaks, Hilton Head attracts approximately 2.5 million annual visitors. At 12 miles long and 5 miles wide, Hilton Head Island is the largest barrier island between Long Island and the Bahamas. Development at this popular travel destination has been comparatively restrained by stringent standards set forth in 1956 by visionary Charles Fraser's master plan for the island's first resort community, Sea Pines Plantation. The Sea Pines Plantation plan established Hilton Head Island as the first Eco-planned resort destination in the United States. Today, Hilton Head Island contains several environmentally planned residential and resort communities. Neon signs, bright street lights, and tall buildings are not permitted, allowing visitors and residents to see the stars at night. A good first stop for your visit is the Hilton Head Island Welcome Center, where you can collect maps, brochures on local activities, schedules of upcoming events and more. Also, check for discounts on attractions, golf, dining, fishing, accommodations. With its growing popularity, Hilton Head Island attracts visitors for most of the months of the year. Roughly one-third of the visitors choose Hilton Head primarily for the golf. During the annual summer school break, families flock to the island to enjoy the beaches and an array of family-friendly outdoor activities. The comfortable temperatures and somewhat lower humidity of spring and fall have made the island a popular destination for romantic retreats as well as girlfriend or buddy group getaways. Even the traditionally off-season months of January and February have become busier during the past several years, with only a handful of restaurants continuing the practice of closing for a winter break. Hilton Head's proximity to the Gulf Stream produces a balmy, subtropical climate year-round with an average daytime temperature of 70 degrees Fahrenheit (21 degrees Celsius). The average annual ocean temperature is 69 degrees Fahrenheit (20 degrees Celsius). The coldest months are December, January, and February when temperatures fall to average lows of 40 degrees and highs around 60 degrees. The summer months are generally hot and humid, with July and August's temperatures frequently approaching or reaching above 90 degrees; however, the prevailing ocean breezes of summer help keep the island much more comfortable than inland locations. The hurricane season runs from June 1 - November 30. Most accommodations at Hilton Head Island are upscale while maintaining a casual and comfortable coastal vacation ambiance. Following the model of The Sea Pines Plantation, the island's first resort development, several Hilton Head Island resort communities have been planned to include an array of accommodations, recreational facilities, and services. Most resort communities feature on-site golf courses and tennis facilities, beaches, shopping areas, restaurants and a combination of private homes, rental properties and hotels. The Sea Pines Resort: Set on 5,000-acres at the southern tip of the island and home to the famous Harbour Town Yacht Basin and Lighthouse, accommodations include 500 suites, villas, and beach houses. 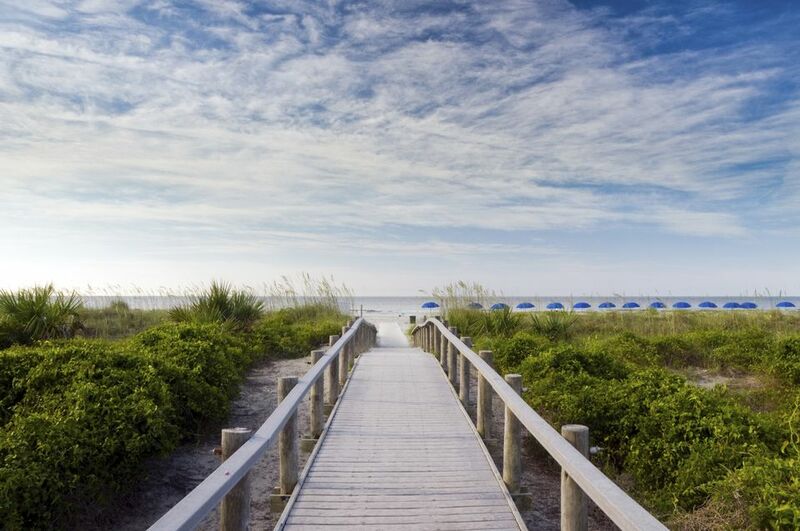 Palmetto Dunes Resort: Palmetto Dunes is located mid-island on some of the best Hilton Head beaches and offers accommodations in vacation homes and villas, as well as at the popular Hilton Head Marriott Resort and Spa and the Hilton. Forest Beach: Located between The Sea Pines Plantation and Palmetto Beach, this resort offers a variety of vacation homes, villas. and hotels, plus the convenience of popular Coligny Plaza. Shipyard Plantation: This 800-acre gated resort and residential community offer accommodations in an array of vacation villas, some homes, and the Sonesta Resort Hilton Head Island. It is located adjacent to the Forest Beach area. Port Royal Plantation Area: Located at the northwestern end of Hilton Head Island, the Westin Hotel Resort and Marriott's Barony Beach Club are located in this primarily residential resort area. Hilton Head Island’s official beach season is April 1st through September 30th of each year. Many Hilton Head resorts offer private access to the beach, which is public from the ocean to the high water mark. Official swimming areas have been designated for the Alder, Coligny, Driessen, Folly Field, and Islanders beaches. During the beach season, lifeguards are stationed in each of the designated swimming areas and other heavily populated beach areas. Check with a lifeguard before entering the water if a yellow caution flag is flying. Animals are not permitted on the beaches between 10 a.m. and 5 p.m. Friday before Memorial Day through Labor Day. Animals must be on a leash between 10 a.m. and 5 p.m. from April 1 through the Thursday before Memorial Day and the Tuesday after Labor Day through September 30. At all other times, animals must be on a leash or under positive voice control. Any messes that animals make on the beach must be removed and disposed of properly by the person(s) in control of the animals. Known as The Golf Island, Hilton Head, along with nearby Bluffton, offers more than 20 public or semi-private golf courses with public access for visiting golfers. Approximately one million rounds of golf are played each year at Hilton Head by golfers of all ages and ability levels. An estimated one-third of all visitors choose Hilton Head strictly for the golf. Many of the courses have been designed by some of golf's legendary figures, including George and Tom Fazio; Arthur Hills; Rees and Robert Trent Jones; Pete Dye; Jack Nicklaus; Arnold Palmer; George Cobb; Gary Player; Fuzzy Zoeller and Willard Byrd.